Breaking new ground, Fine & Country is rapidly becoming known for its unique blend of intelligent and creative marketing coupled with a professional approach to the sale of individual and country property. Fine & Country has an enviable reputation for marketing and selling country homes, cottages, individual modern homes, conversions, equestrian and waterside property. Using cutting-edge lifestyle marketing for property, taking pride in marketing the character, location, setting and feel of the property – rather than the traditional specification-lead approach. Utilising our sophisticated technology, we combine the best of all worlds local, regional, national and international exposure to the widest market. Fine & Country Homes from Clifton & Co as a local agent knows the market-place intimately – from property values, advantages, features and benefits of the vicinity including schooling and transport to future developments and industry. Fine & County Homes from Clifton & Co are perfectly placed and qualified to assist and guide you through the whole transaction with a refreshing approach to effective marketing individual, period and exclusive property, combining individual flair and attention with our local expertise as an award winning independent estate agent. Being part of a Fine & Country’s strong national network we possess a powerful marketing ability with one of the finest selections of property for sale across the UK and overseas. Fine & Country Homes from Clifton & Co are privileged to be the dedicated regional office for North West Kent and we are based at our prestige showroom; 1 Church Road, Pond View House, Kent DA3 8DL, and can be contacted on 01474 700009. or email northkent@fineandcountry.com . 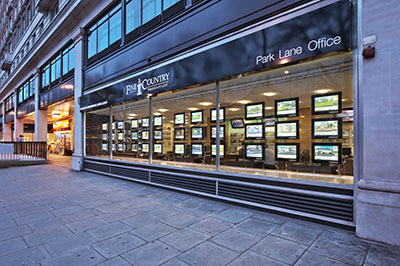 Along with a prestigious Park Lane, Mayfair, W1 showroom featured here, there are Multi-award winning luxury real estate agents in 300 locations worldwide.